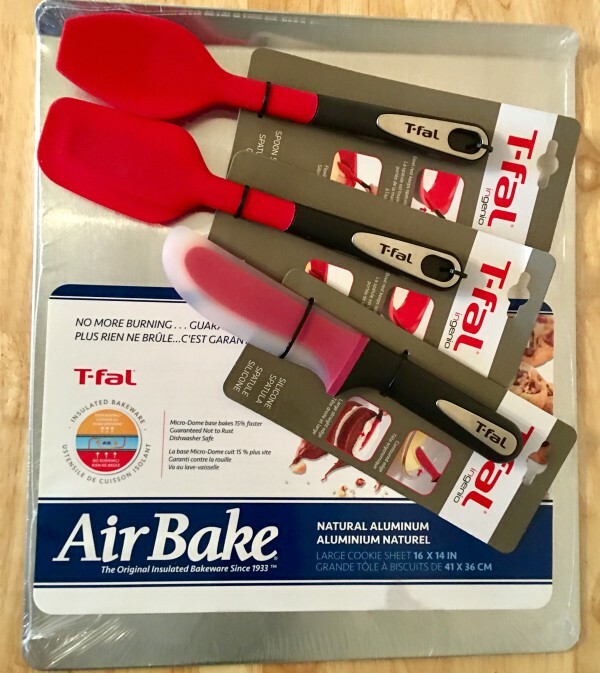 Stacy Tilton Reviews: Bake the perfect cookie with T-Fal! Bake the perfect cookie with T-Fal! Have you ever heard the expression the secret to the perfect cookie is all in the pan? If so you've probably talked to someone that uses a T-fal AirBake Cookie Sheet. I've been using them for years and I swear by them when it comes to baking cookies. There's just something about their AirBake technology that bakes up the perfect cookie every time. Well...that is unless my son is baking them. For some reason he over bakes them EVERY time. But you can't blame the cookie sheet for that! Pair up the cookie sheet with a few other T-fal kitchen tools and you're ready to bake up (and decorate) the perfect cookies! Available in Natural Aluminum, Nonstick and brand new Copper finish, the AirBake cookie sheets use unique Micro-Dome technology distributes pockets of air that provide even heating of the baking surface, meaning better browning, decreased bake times, and practically NO BURNING. The T-fal Ingenio Spoon Spatula features a flexible silicone design. This is ideal for scraping bowls or spooning batter. Bowl rest prevents the spatula from sliding into the bowl. Great for stovetop use as well, heat resistant to 500 Degree F. Easy to clean and is dishwasher safe. With flexible silicone ideal for scraping sides of the bowl or folding mixtures, the T-fal Ingenio Blade Spatula will make baking this season easier than ever! Featuring a unique hook on the handle to prevent the spatula from sliding into the mixing bowl will ensure to keep messes to a minimum.